Harvest NY Ag Business Development and Marketing Specialist, Lindsey Pashow, will be discussing CCE's Cider Apply Supply Chain Survey. This event includes a trade show and opportunities for networking (including a Social Hour following the sessions) with others in your industry. The cost for this event is $100 (or $90 for each additional person from the same brewery, cidery, or farm). This includes a light breakfast, lunch, an evening social hour and a 2018 Finger Lakes Craft Beverage Glass. Be sure to register early (before March 20th) to avoid the late registration price of $115. Register online for the conference. Sponsored by Waterloo Container. 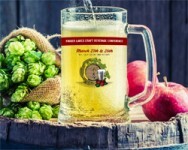 This registration site is for people registering for the Finger Lakes Craft Beverage Conference (FLCBC), or people registering for the FLCBC and the FLCBC Field Trips. Please call Seneca County CCE 315-539-9251 or email Derek Simmonds with any questions.